Hawick kept their BT Cup hopes alive, if only just, breaking Poynder Park hearts on Saturday with a hard-fought victory. The Greens’ John Coutts, Rory Scott and Nick McLennan all scored tries, while Neil Renwick contributed four points with the boot to hand Hawick a seemingly comfortable 19-3 half-time lead. But a Frankie Robson score and a second Andrew Skeen penalty set up a grandstand finale, with Hawick managing to hang on to claim victory and a semi-final spot against BT Cup holders Heriot’s at Mansfield Park on March 7. No one can accuse Hawick of being predictable. One minute they are taking Scottish rugby by storm, the next they are allowing a moderate Kelso side to play like the Barbarians. Frustratingly, this quarter-final victory was another mixed bag, just when the Greens coaches are seeking ruthless certainty as their charges bid to challenge for an unprecedented BT Premiership, Border League and BT Cup treble. The pleasing news for Hawick supporters, despite Saturday’s tight scoreline, is that opponents have increasingly little idea what to expect from the men in green – will they be battered in the set-piece by an imposing front eight, outlasted in the final quarter by superior fitness or wrong-footed in the midfield channels? 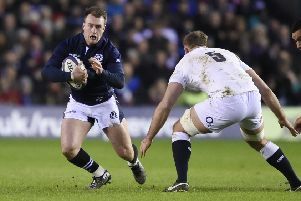 Every decent side needs several ways of winning and Hawick, particularly when they are not firing on all cylinders, have developed a knack of securing the spoils with a variety of tactics. The Kelso clash looked to be heading towards a total annihilation for the hosts during the early exchanges. Coutts putting the Greens in front after finishing off a 40-metre dash from Renwick, who slotted the simple conversion. Scott then doubled Hawick’s try count with a try on the wing. Finding themselves 12-0 behind after 10 minutes, Kelso rallied and managed to stem Hawick’s rampaging backline until a pulsating end to the half. Bruce McNeil was yellow carded, which allowed Skeen to kick Kelso’s first points, before the Robbie Dyes’ Kiwi prop McLennan crashed over from close range to hand Hawick a 19-3 half-time lead. The second period was both frantic and interesting with two yellow cards and a breakaway try opening the door for a possible Kelso upset. Robson scored after pouncing on a neat chip forward from fly-half Skeen. The centre was the quickest to react and had the intelligence to make sure of an easy conversion for Skeen by touching down under the posts. Hawick were reduced to 14 men when Keith Davies was yellow carded. Skeen duly added his second penalty to reduce the deficit to six points. Renwick was then the third Greens player to spend time in the sin bin in the closing stages but Hawick somehow managed to hold on for victory. Hawick: N. Renwick, N. Walker, J. Coutts, R. Hutton, S. McLeod, M. Douglas, S. Goodfellow, S. Muir, L. Gibson, N. McLennan, M. McKee, B. McNeil, N. MacTaggart, R. Scott, K. Davies. Replacements: M. Landles, W. Blacklock, R. Gibson, G. Cottrell, L. Armstrong.